As noted by Albany Archives, the section of the Northway from Albany to around Glens Falls officially opened this week in 1961 (that is, Nelson Rockefeller cut a ribbon). 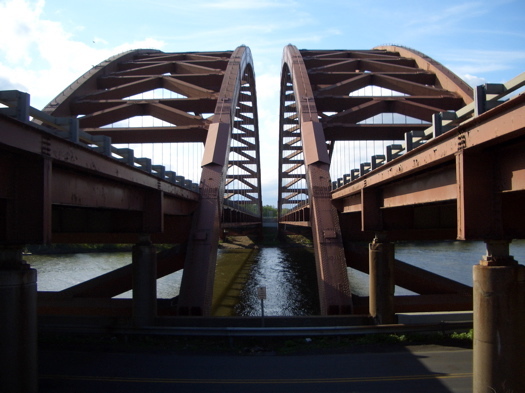 Construction on the Northway started in 1957 in segments, beginning at the southern end. By the time it was finished in 1967, the 176-mile highway cost $208 million to build -- that's about $1.66 billion in 2015 dollars. The federal government paid for 90 percent of the cost. Debate about the route the road would take provided many heated arguments. Politicians first couldn't decide whether it should go east or west of Saratoga Springs. There were contingents that believed it should go closer to the Vermont border, and that would be fine with those who believed it should not go anywhere near the Blue Line - the Adirondack Park border. While many possibilities for the 'route' were bantered about, there were three that were in the final consideration: 1) Albany to Whitehall, up to Ticonderoga, missing the Adirondack Park and joining the current Northway at New Russia; 2) Follow the Schroon River Valley up the west side of Schroon Lake ; and, 3) From Saratoga Springs to Lake George, passing through Queensbury and then following a similar route up the west side of Schroon Lake. The last two options meant going through the Adirondack Park, and the idea prompted opposition. A group called Citizens' Northway Committee organized in 1958 in an attempt to route the highway around the park. The group argued in favor of a path along the Champlain Valley that it called the the Champlain Northway. The matter was ultimately sorted to some extent by a public vote: The path through the Adirondack park required a state constitutional amendment, and it passed in 1959. The daily volume of traffic along the southern sections of the Northway has grown a lot over its history. 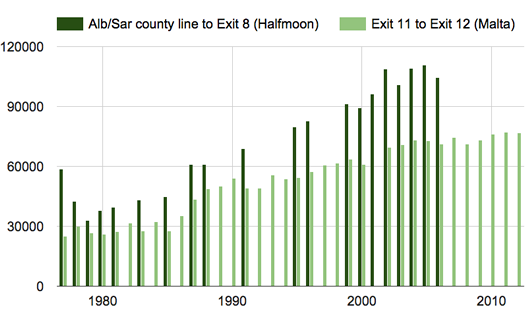 Here's a look at average daily Northway traffic data by year going back to the 1970s, in two spots: from the Albany/Saratoga county line to Exit 8 (the section starting in Halfmoon at the bridges) and in Malta from Exit 11 to Exit 12. These numbers are via the NYS Department of Transportation website (also on data.ny.gov). There are some years for which the data isn't published, thus the gaps. The population in Saratoga County has increased a lot over the history of the Northway. In 1960 the county's population was about 89,000 -- in 2010 it was almost 220,000. As an alternative to Route 9, the Northway made it easier to get back and forth between Albany and Saratoga counties. It's interesting to think about whether, in an alternate timeline with no Northway (or maybe a different Northway), Saratoga County experiences the same sort of growth. And, of course, there are the implications for the future. From a 2012 study done by outside consultants for the state Department of Transportation: "Forecasts show that, unless corrective actions are taken, congestion and delays will continue to worsen throughout the combined I-87/US9 corridor, and grow to intolerable levels, as the Capital District's population and employment opportunities grow." One of the odd things about the Northway is that there's no Exit 3 -- the numbers skip from Exit 2 to Exit 4. Perhaps even more odd, it seems like there should be an Exit 3, because the airport doesn't have an easy-access exit. In the late 1950s, the original Interstate highway system plan for the Capital District proposed the construction of Interstate 687, also known as the Northway Connection. Interstate 687 was planned as an east-west expressway connecting Interstate 90 at Exit 5A (Corporate Woods) with Interstate 87 at Exit 3 near Albany-Shaker Road. Interstate 687 was also planned to provide an intermodal connection between the Albany Airport, Interstate 87 and Interstate 90. When the southern section of the I-87 was opened to traffic in 1960, a gap in interchange spacing and numbering was purposely left between Exit 2 (Central Avenue) and Exit 4 (Wolf Road/Albany-Shaker Road) for a future Exit 3 interchange with Interstate 687. Interstate 687 was never constructed due to changes in the State and Federal funding programs. The proposed highway was removed from the Capital District's long-range highway plan in 1973 and withdrawn from the national interstate system plan in 1977. Remarkably, there still isn't a clear answer for providing an easy Northway exit for the airport, though the current Exit 4 reconstruction project -- which is replacing the overpasses constructed during the orginal building of the Northway -- could end up providing a new way. That I-687 -- the "Northway-Northside Connection" -- was never constructed isn't a loss. It was part of a plan that would have infamously buried a highway under Albany's Washington Park. But 687 does help explain some other quirks, among them: why Corporate Woods has its own exit (687 was to connect I-90 with I-87 there); and why Route 85 stops short of Central Ave (the Crosstown Arterial was to carry Route 85 through to I-687). Thus, perfectly illustrating why a commuter rail line along a similar route has never materialized. "unless corrective actions are taken, congestion and delays will continue to worsen throughout the combined I-87/US9 corridor, and grow to intolerable levels"
Hah, have those consultants ever been to California? Drivers will tolerate quite a lot. They left out the most important fact about the Twin Bridges. In the 70s (because of the design of cars) we kids in the backseat leaned back and looked up through the rear window while going under the bridge. BAM! At the end of the bridge, the bridge banged right into your face. Well, I guess you had to be there.